Bet we have never seen anything like this. This is a dream come true for those who are keen to invite a Laughing Buddha to help in their investment, speculative luck, gambling luck and business. This is an immaculately finished large Red Robe Laughing Buddha riding on a gold Money Frog with a large spread of wealth bag, gold ingots and gold coins as the base. Money Frog is the most significant symbol of prosperity in Feng Shui. For generations since ancient China, this mythical Money Frog is one of the five chinese holy creatures that protects us against misfortune and brings to our household bigger enrichment in wealth. We're talking about creating abundance in wealth for serious Feng Shui practitioners. He victoriously raise a large gold ingot on his right hand to signify success in gaining wealth and riches. He holds the magic fan on his left to fan off potential financial losses, bad luck and finance obstacles. Wearing the red robe with the crane designed on his robe, He overcomes sadness and obstacles, and provide you a smoothride and happiness throughout the year as opposed to sorrowness. He also wears the mala beads around his neck with a big that would dissipate all negativities. 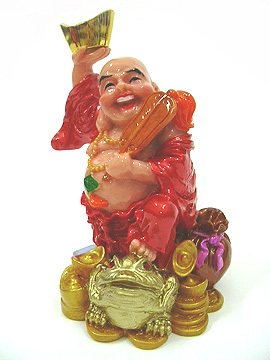 This Laughing Buddha brings happiness, riches and wealth into homes and especially depicted in RED, He is great at countering Quarrelsome Star-3 in Flying Stars.This masterpiece would definitely be admired if placed at cash register, investment desks, treasurer's desk and prominent areas of your home. What Laughing Buddha symbolizes and how to place this deity? The Laughing Buddha is actually the Future Buddha or better known as Matreiya Buddha in Buddhism. He is said to be currently living in the 6th layer of heaven and will be reincarnated to earth as a very handsome man with a group of other deities from the heaven. Since the Matreiya is going to be the future Buddha, that is why it is often linked to happiness and fulfilment of no sufferings in the future for the people. Because of the Matreiya being associated to happiness, the chinese had tranformed the symbol to show the Buddha as being a fat and happily laughing Buddha. In the past, where poverty is common, fat people often denote people who have more than enough to eat and contented in life. Therefore fat denotes happiness. The Matreiya is then better known as the Laughing Buddha to the chinese. The Laughing Buddha is the ultimate symbol of happiness in Feng Shui because he bestows ultimate fulfillment in everyone's life. He plays the role to take away your problems, worries, stress, anger, pressure and sadness. The Laughing Buddha is also said to bring incredible good luck, excellent fortune, prosperity and wealth luck to households, offices and businesses. The presence of His symbol rejuvanates energy "chi", wipes out flame tension and anger and turn the aura into blessings of pure happiness. Today, the Laughing Buddha has become so popular that the symbol is placed almost everywhere as it is believed to bring a great future filled with happiness. It could be found at receptions, cashier counters, living rooms, hotel lobbies, temples and almost all business premises in Asia. The Laughing Buddha is usually connoted carrying wealth symbols such as large ingots, pots of gold and a "treasure bag", because the powerful Laughing Buddha is very much associated to abundance and wealth luck. He is suppose to bring you unlimited supply of gold to make one happy as imagined by people. He sometimes carry a "wu lou" (gourd) to bring blessings to health and a "ru yi" to signify authority or victory in undertakings. One may also find a Laughing Buddha denoted with children surrounding Him. For those who are seeking for descendants luck, the Laughing Buddha also bestows many children into families. A good Laughing Buddha image would have a face that is very smiley to signify fulfillment and joy. 1. Display his image in your living room or family corner (east) to harmonize the whole family and take away all the problems and quarrellings. 2. Display him in your personal Sheng Chi direction to tap the many luck for your personal growth, wealth, success and good health. The symbols will bring you lots of good news and surprises. 3. Display him in the southeast sector of your dining, bedroom, reception or living room to enhance your wealth luck, receive good tidings in speculation, gambling, investment and receive windfall luck. 4. Bosses and politicians can place him in their offices or home for protection against unwanted unhappiness/stress and attract tremendous good luck. 5. You may also present the Laughing Buddha as a gift for any auspicious celebrations or occations to your loved ones or as business gifts. The symbol is especially useful when presented to those who are going through tremendous bad luck. 6. Place him on the dashboard of your car so that he can bring home many tidings of good news. 7. Place him on your office table to take away all stress and bad politics or backstabbing. He will speed your way towards achieving your happy goals. 8. The Red Robe Laughing Buddha is the best cure for Quarrelsome Star#3. Note: Kindly do not place the image in kitchen and toilets.